Think of your web presence as a multi-dimensional business asset. Google values businesses that attend to every aspect of their digital footprint in favor of those who narrow their focus on a singular task or concept. Contractors will sometimes inquire as to why they lost their Maps placement on Google, after having been ranking in the Map Pack for so many years. The most likely culprit of this precipitous drop is a lack of marketing channel diversity. It’s one of the reasons we discourage clients from investing in standalone services such as website design, pay per click, or even lead generation. The most profitable contracting businesses have their hands on all of these things, and allocate resources to account for each. Every contractor reading this should diversify their marketing channels. If you are looking for web design only, you will be disappointed with the results. Everything online works together, and a lack of cohesion between design, optimization, Google maps, and other entities, makes for a porous online presence and one that will more than likely fail to produce desirable results. SEO will be the foundation of your contracting businesses’ web presence. In contrast to many of the other items on this list, SEO is seldom considered a standalone service. This is particularly true when it’s coming from a reputable company. Still, business owners often view SEO as a waste of money, and prefer to focus on quick-money-grab’s like PPC. We noted in the introduction why attaching your entire business to a single item like pay per click is a poor idea. But with a strong foundation of search engine optimization, PPC, and other items like it, can become much more productive while not accounting for too great a percentage of your traffic. We discourage pay per click as a standalone item, but when used in concert with other techniques, we encourage it. In diversifying your marketing channels, PPC from Google Ads can be a valuable one. With parameters allowing advertisers to set constraints on budget, targeting, and things of that nature, a properly managed PPC campaign can yield a substantial ROI. The difference is that it is not the only source of traffic, and in fact, should not be. The Ad platform once known as AdWords can’t be the only source of traffic, but it can be a source. Local SEO is a big deal, but did you know that Google Maps & Google My Business are the foundation of geographical SEO? 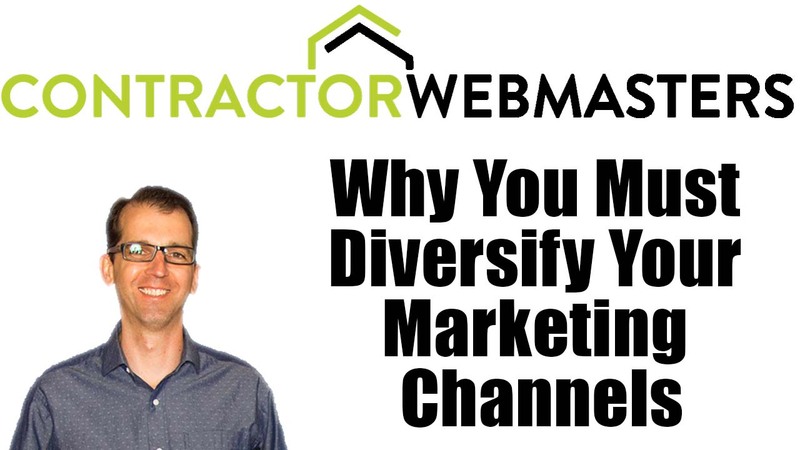 To diversify marketing channels, having a well-optimized GMB profile and a verified Maps listing are non-negotiables. We strongly discourage the use of any single method for traffic generation, but if you were absolutely forced to choose one, it would be Google My Business / Maps optimization. With that said, it works even better when combined with other forms of marketing, particularly a strong foundation of organic SEO with a well-designed custom website for your contracting services, whether it be roofing, HVAC, etc. Some marketing platforms empower contractors to pay only for leads. Often times these services provide shared leads, which forces businesses to fight against one another for the same customer lead. Since these leads are being funneled through channels that are not owned by the exclusive brand, there exists a lack a necessary control over them. Leads are obviously imperative to contractors. Without them, none of the rest matters. But it’s important to understand that the rest is there to ensure that exclusive leads are in fact generated. SEO, PPC, Google Maps, and Social Media can all generate leads with sufficient strategic input. Have you ever had an Ad agency attempt to sell you on a Facebook Ads package that involved no other form of marketing? If so, run for the hills. While Facebook and other social platforms like Instagram, YouTube, LinkedIn, & Twitter, all hold value, both through organic marketing and especially paid advertising, they cannot reach their fullest potential as a singular entity. Instead, social outreach should be an extension of a rock solid foundation that is rooted in the highest quality SEO and is supplemented with PPC, Google Maps, Lead Generation, and other marketing ventures. For organic social conversions, consider integrating YouTube videos within your website HTML, and vice versa with blog posts on your social feeds. Google favors brands no doubt. But what does Google consider a brand, especially in the realm of local contractors? For one, a company or individual who established a presence on a myriad of marketing platforms are more likely to be considered brandable from Google’s perspective. None only is brand diversity appealing to consumers and helps them recall your logo, but the inbound linking power of multiple incoming domains URLs is a strong signal to search engine crawlers. One thing is for certain, at least some of your competitors have more diverse marketing campaigns than you at the start of 2019. This can be the year you close the gap and root yourself in a strong and sustainable online presence. Contractor Webmasters can help you get there.